November 25, 2015 7:10 pm / 14 Comments on Happy Thanksgiving! May The Lord Bless Us With Appreciation For All He Has Done For Us! In this letter, we see Christ presented as the One who controls and authorizes the Holy Spirit and His Pastors to present His Word to His people. We also see the condition of the church at Sardis was grave. They were described as spiritually “dead” and yet did not see the horrible condition they were in. They believed themselves to be alive and well. We saw that the remedy for their situation was for them to wake up and recognize their need; hold fast to the areas of service that was still in existence; take heed to the warning from Christ, and repent of their spiritual laxness and lack of concern. They received a warning that if they did not deal with their sin that Christ would come upon them quickly and unexpectedly, not to bless but to chasten them for their apathy. Christ promised them that those who were faithful to His commands, proving they were genuinely saved, would be assured of receiving eternal rewards and dwell forever in His presence. Finally, we saw that He promised those who were genuinely saved (overcomers) would possess the righteousness of Christ, are eternally secure in Him, and be presented to God with Christ proclaiming their innocence based upon His shed blood. In this letter, we see Christ presented as the promised Messiah of the Old Testament. We also see the church as being faithful having great opportunities of service open before them. Even in the midst of great persecution, they remained faithful to Christ, His Word and continued to profess Him as their Lord and Savior. The Lord promised to them that based upon their patient service towards Him, He would graciously without some of the great Roman persecution that would take place in the future. The Lord leaves them with the promise of His quick return and the responsibility to remain faithful so that they would not lose their eternal rewards. Finally, we saw that He promised the overcomers that, because they were owned by the Lord, they would be permanently in the presence of the Lord throughout eternity, would be recognized as citizens of New Jerusalem, and would experience a new level of intimacy with Christ. In this letter, we see Christ presented as the One who possesses authority, reliability, and ability to instruct us. lead us and rule over us. We also see the church was oblivious to their true spiritual condition. They were described as being (spiritually) wretched, miserable, poor, blind and naked. They did not see the sin in their midst and quickly repent (hot to be obedient to Christ), nor did they see the sin in their midst and stubbornly resist repentance (cold in their obedience of Christ), instead they were unaware of their own sin (so unconcerned about their sin they didn’t make the effort to examine themselves (neither cold nor hot… lukewarm). Because of this the Lord declares that if they do not take action, He will reject them and their hypocritical worship. To remedy their situation, they were to begin rise up, take action and serve the Lord anew by searching the Scriptures for insight into their horrible condition. The Lord warned them that if they remained lukewarm, He would chasten them for their disobedience. Finally, we saw that He promised those who were genuinely saved (overcomers) that He would begin to convict each member individually, desiring renewed fellowship with them. The Lord promises to overcomers in the church that they would rule with Him over a new heavens and earth throughout eternity. It would be much like a restored Garden of Eden that would include man’s perfect dominion over the newly reformed earth. In the next lesson in our series, we will be looking at Revelation 4:. In this chapter and the following chapter, we will see a vision of heaven and a glorious scene of the worship of God and the Lamb (Christ) by the dead saints who have gone on before us. Beginning Monday (July 8th) the SIH blogsite will be undergoing a major format change. This maintenance will probably last through Friday (July 12th). During this time, BY GOD’S GRACE, SIH blog will not go offline for any extended period. However, there will probably be short time periods where the site will not be accessible. Please keep in mind, this is only a temporary situation and SIH will be up and running normally within the week. Following these changes, all of the SIH sites will continue to use the same website addresses (URLs). During this maintenance week, the daily devotional postings will continue on as normal. Following the completion of the SIH blogsite, you will see many changes that will make the SIH network of sites more easily accessed by those who are new visitors to the SIH blogsite. It will also allow for greater unity between all the SIH sites on the web. Finally, it will allow the growth of the ministry to be handled in a more streamlined, less time consuming way. Many thanks to all of you who have faithfully followed SIH blog. Please be patient with all these changes that are coming. This is a one time change that, Lord willing, should be sufficient for several years to come. 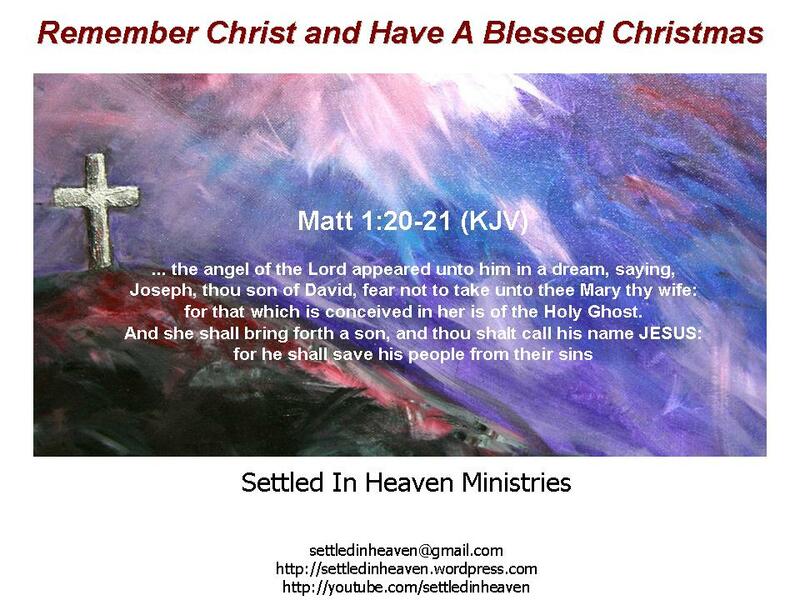 Welcome to my Blog “settled in Heaven”. By the Lord’s grace I will be attempting to write short Bible Lessons / Devotions on a regular basis. Being a Baptist Pastor for over 15 years, my heart’s desire is for this blog to be of spiritual benefit to any who might read it. I trust this blog will render both encouragement and knowledge to those of us seeking to serve the Lord in greater ways as members of His spiritual family. For those who have not yet trusted in Christ as their Lord and Savior, I hope this blog will help them to see the need and urgency to receive the Lord’s gracious forgiveness. May the Lord bless our future studies of His Word.